On this worksheet, kids trace number 12 and then write their own. 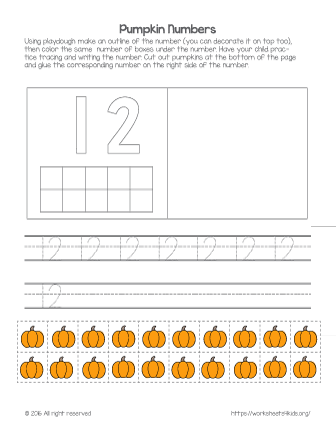 After tracing and writing the number 12, they cut out pumpkins and glue the right number in the provided boxes. This worksheet is great for building essential math skills such as writing whole numbers and counting objects. See in a book: Fall Math Pack.